Cook tomatoes in butter in a skillet for about five minutes. Turn over. Combine remaining ingredients in a separate dish, stirring well. Pour over tomatoes and simmer for five more minutes. Aunt Doris gave Robin this recipe years ago. Grease a 10 x 6 baking pan. Combine stuffing, garlic salt, oregano, and sugar; mix well. Arrange half of the tomatoes in pan; top with layer of stuffing. Sprinkle with ½ cup of cheese and onion. Spread with remaining tomatoes. Sprinkle with remaining cheese. Dot with butter. Bake at 350 degrees for 30 minutes. This is the Holy Grail of our family’s cooking traditions. 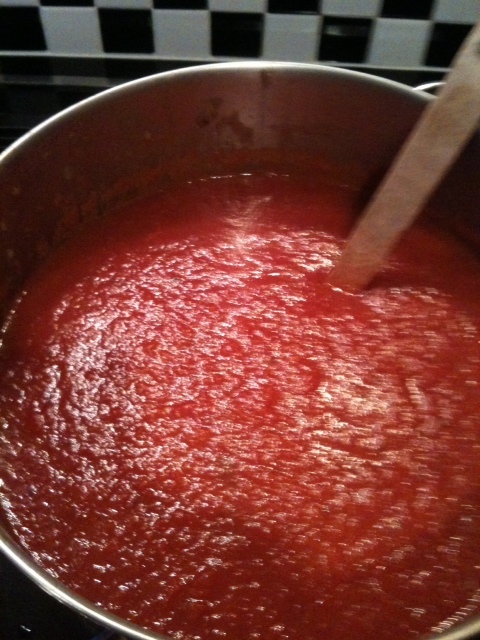 The recipe makes a large pot of sauce which can be divided. While some is served immediately, the rest is frozen for future meals. Brown the sausage and pork in a small amount of olive oil. Add the garlic and cook until it is light brown. Add the tomato paste and tomato puree. Add two cups of water, the chicken broth and the red wine. Add the herbs. Add up to one cup freshly grated Parmesan cheese. Simmer on the stovetop for two hours. Taste every time you walk by. Go, “Mmmmmmmm.” Tweak seasonings to your taste.